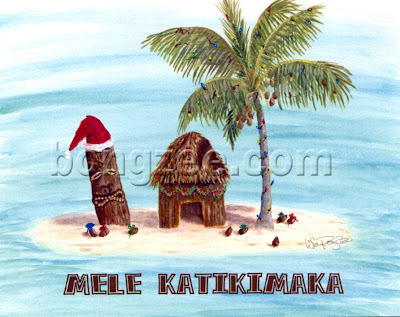 My new Hawaiian Tiki Island Style Christmas Cards are here. These Christmas Greeting Cards were designed from one of my original oil paintings, and feature a little tropical hut, decorated up for the holidays, along with a cool Tiki Dude that is getting into the Christmas spirit with his Santa Hat. And you can’t forget the Christmas Tree! Well, maybe this isn’t your typical Christmas Tree, but here in the Islands, this is how we like to do it! Tree is lighted and the coconuts are gift wrapped, ready for Christmas Day ! Cards read “Mele Katikimaka” on the outside (tiki’s version of “Mele Kalikimaka”) and on the inside, “Hau’oli Makatiki Hou” (tiki’s version of “Happy New Year”). If you would prefer the cards to be blank on the inside, that is another option. My Mele Katikimaka cards have sold out. Please check back later or email me if you are interested. Mahalo! So, I've got "Birds on the Brain". Could be the season, turkey day is right around the corner, or it could just be that I am a bird brain in general. But whatever the case, I was in the mood to paint a bird. I have never even drawn a bird before. I HAVE drawn people giving the bird (on several occasions, actually), but that doesn't really count. He is my sweet little Nene Goose (pronounced "Nay nay" - like a horse). 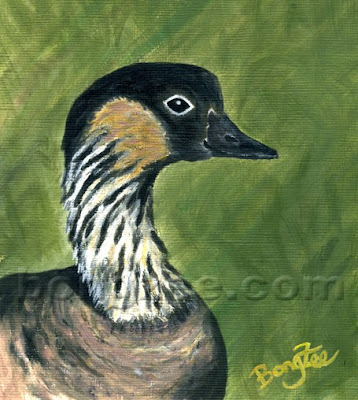 The Nene, or Hawaiian Goose, is the Hawaii State Bird, and I think they're really special! VAST HOLIDAY ART SALE !! Going on now! Check out the wonderful selection of beautiful artwork from all our VAST members on sale now. I love to paint, I love the Tropics. Put them together, and you get Lisabongzee's Island Dream Life Tropical Paradise Paintings.